This morning, as expected, the Genovese priest Msgr Guido Marini, 42, was named the new Master of Papal Liturgical Celebrations by Pope Benedict. Shown at left in an undated photo with his former boss, now Secretary of State, Marini Due (who earned a doctorate in the "psychology of communication" earlier this year, alongside an earlier JUD -- the dual-laurea in canon and Roman civil law) is expected to take up his new appointment later this month, following the papal visit to Naples. 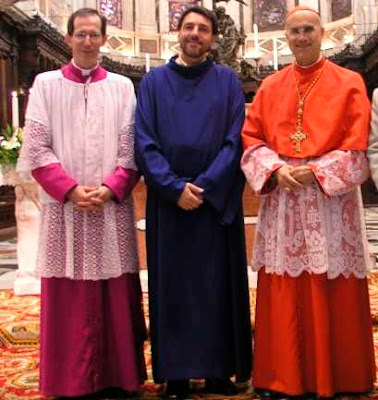 Also in the photo -- at center, in blue -- is Gianfranco Giolfo, the director of music at Genoa's Duomo (Cathedral) of San Lorenzo. The first two got to Rome... and, well, you know what they say about things happening in threes. On a side note, apologies for the slow posting -- just coming off a weekend pilgrimage to San Antonio for the RNA Convention... and now, on to the Premier See, where this feast of Edwin O'Brien's favorite saint -- Therese of Lisieux, the "Little Flower" -- marks his installation as Baltimore's 15th archbishop. As O'Brien told his his priests and religious that he looked to them "to be the spiritual 'reactor core' of Catholic life" in the 520,000-member archdiocese" at a Vespers service last night in the Basilica of the Assumption, the new regime in the nation's oldest local church began at the tomb of its Peter: the founder-bishop John Carroll. Much could be said about Friday's lovefest installation in Pittsburgh... But in the meantime, do yourself a favor and watch the homily.